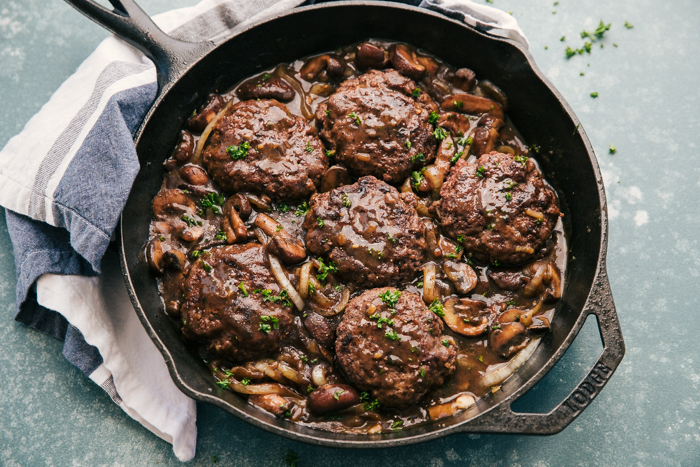 Hamburger Steak is a hearty comfort food that will stand the test of time. Large patties flavored to perfection and covered in a rich onion and mushroom gravy, makes this a delicious dinner choice. This is one of my favorite skillet meals I have made. 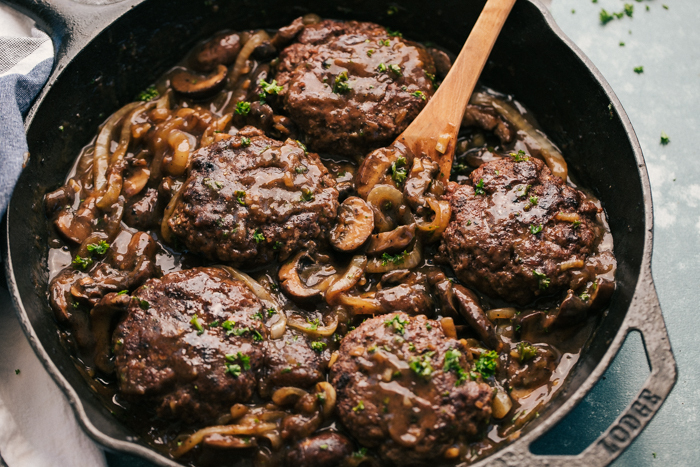 The simplicity of this hearty comfort food recipe is supreme and every bite of this Hamburger Steak is sensational. How can you ever go wrong with beef mixed with a warm onion and mushroom gravy? The sizzle of these Hamburger Steaks cooking up with all the flavors will bring your family into the kitchen without having to call them all to the table. This meal will speak for itself with its amazing aroma. Hamburger steak is ground beef made into a patty and severed with brown gravy. It is similar to that of a salisbury steak. It is a hamburger served without a bun. Hamburger Steak is amazing over warm buttery mashed potatoes or over pasta or rice. It is even perfect just on its own. When I made mine I served it over mashed potatoes and it is so filling you really don’t need too much else to go with it. The hamburger and gravy speak for itself. HOW DO YOU MAKE HAMBURGER STEAK PATTIES? In a large bowl combine ground chuck, prepared horseradish, minced garlic, garlic salt, cracked pepper, Worcestershire sauce, and 2 Tablespoons of onion dry soup mix. Divide beef mixture into 6 patties. Heat a large cast iron skillet with 2 Tablespoons of olive oil over medium heat and place patties in skillet. Cook 5 minutes a side, until golden brown. Hamburger (red meat) has long had a bad reputation for heart disease, but more studies have shown it is more processed meats that can be the problem. One hamburger steak with gravy is approximately 320 calories with 23 grams of protein. As always all things in moderation is good. HOW TO MAKE HAMBURGER STEAK WITH MUSHROOM GRAVY? In a large bowl stir ground chuck, horseradish, garlic, Worcestershire sauce, garlic salt, cracked pepper, and 2 Tablespoons onion dry soup mix. Divided mixture to form 6 patties. Heat a large cast iron skillet over medium heat with olive oil and add patties. Cook until brown on both sides, about 5 minutes a side then remove from skillet and set aside. In the same skillet over medium heat( leave any grease or drippings in skillet) add onions and mushrooms and cook until tender about 3-4 minutes. In a medium mixing bowl combine beef broth, Worcestershire sauce, 2 Tablespoon onion dry soup mix, water, and cornstarch. Pour into mushroom and onion mixture and stir to combine. Reduce heat and let simmer about 5 minutes until gravy thickens. Add Patties back in to skillet, cook 5 minutes until patties are heated through and serve. Garnish with parsley. 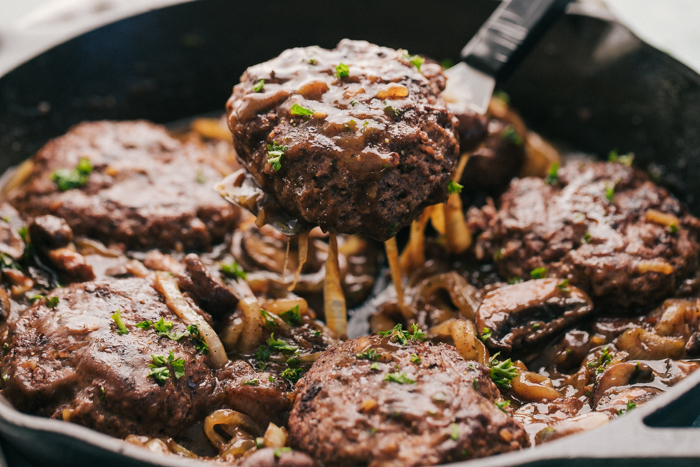 If today is the day you want to make life easy and dinner delicious than make this quick and easy Hamburger Steak Skillet. It will arouse your tastebuds and please a hungry crowd. Remember, cooking doesn’t have to be difficult, but it does need to be delicious. LOOKING FOR SOME SIDE TO SERVE WITH HAMBURGER STEAK? In a medium mixing bowl combine beef broth, Worcestershire sauce, 2 Tablespoon onion dry soup mix, water, and cornstarch. Pour into mushroom and onion mixture and stir to combine. Reduce heat and let simmer about 5 minutes until gravy thickens. Add Patties back in to skillet, cook 5 minutes until patties are heated through and serve. 0 Response to "HAMBURGER STEAK"